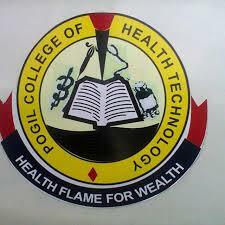 POGIL College of Health Technology, POCOTECH Higher National Diploma [HND], National Diploma [ND] and Technician Programmes Admission Forms, Admission Requirements, Entrance Exam Date, Time and Venue for 2018/2019 Academic Session. College of Health Technology HND, ND and Technician programmes for the 2018/2019 academic year. Duration: 3 & 2 years respectively. Requirement: (5) O’L in English language, Biology, Chemistry, Mathematics, Physics (Not more than two (2) sittings) and National Diploma in Environmental Health by WAHEB for Direct Entry. Duration: 2 years + 1 year IT. Requirement: five (5) O’L Credit in English language, Biology, Chemistry, Mathematics, Physics and one other subject from Geography, Economics, Religious Studies and national Language. Requirement: Three (3) O’L credit in English Language, Mathematics/ Biology/Health Science and two passes in Physics or Chemistry and any other Subject. Requirement: Minimum of four (4) credits in WASSC/NECO at not more than two sittings in the following Subject: English Language, Mathematics, Physics, and Biology. Prospective candidates should pick up Admission forms from the college or any of our accredited agents nationwide. VII. Admission into programmes in POCHTECH is either through JAMB or Direct Entrance Exams.